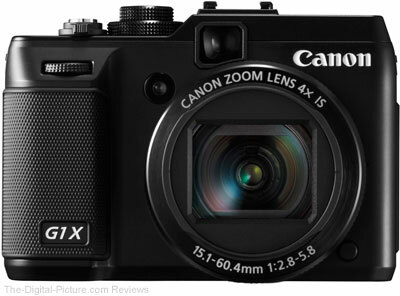 The Canon PowerShot G1 X is not a DSLR, so why is it included in the Canon Digital SLR Camera Reviews category on this site? That question is indeed justified - the G1 X is not a DSLR, but ... the size of the sensor in this camera brings the G1 X's image quality potential in line with the DSLRs that I typically review. From G1 X announcement day, I expected this camera to become my choice for shooting when I couldn't have a DSLR with me - or for when I wanted a second camera - either for backup or for actual shooting. I especially anticipated taking a closer look at the image quality this large-sensored, pro-grade point and shoot camera could deliver. Here is why my anticipation was high: I own several Canon PowerShot models including a G9, S90 and SX10 IS. While these are all adequate cameras for their intended markets, none have the image quality I am typically looking for when shooting seriously. The big reason for their lower image quality is their relatively tiny sensors. 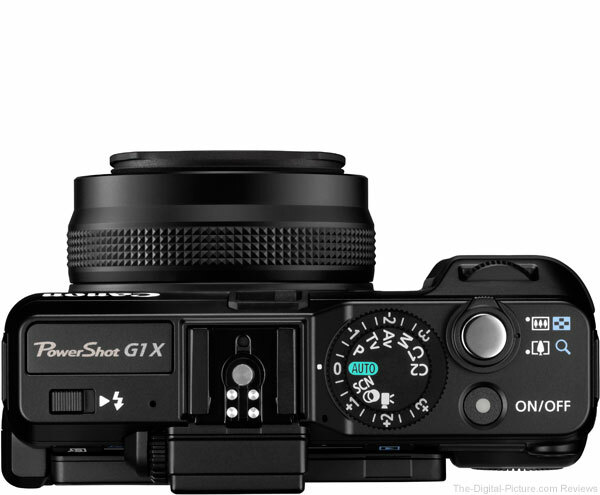 And the big news with the Canon PowerShot G1 X is that it has a near-APS-C-sized CMOS sensor. The size difference is very apparent in the comparison below. Noticeable in the above graphic is that Canon stayed with the 4:3 aspect ratio of the previous G-series cameras. I personally prefer the 3:2 ratio for my compositions, but a 4:3 aspect ratio makes better use of the round image circle provided this (and most other) lens. Cropping to 3:2 is of course an easy option. 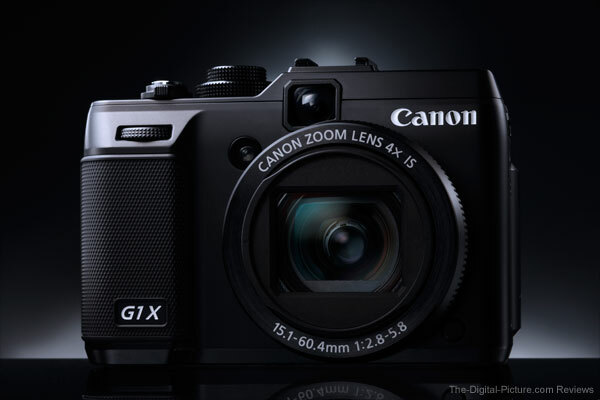 The Canon PowerShot G1 X features 4.3µm-sized pixels - matching the current-at-review-time 18 MP APS-C (1.6x) DSLRs. I expected the G1 X's image quality to be very close to that of the APS-C DSLRs - as long as the lens performed well. The lens quality is my biggest question as I know that Canon produces only excellent APS-C sensors and pipelines to support them. Canon also knows how to make very impressive lenses. Turns out that neither the lens nor the sensor appears to be the limiting factor with this camera - it is the Canon-supplied Digital Photo Professional RAW image processing software that is tripping me up. Being anxious to try out this new camera, I made special arrangements to have the newly-available (preordered) camera to me in Key West, Florida two days into my photo trip. The camera was working out as planned - I carried it when I wanted to go light and when I was carrying a second (and often large) camera and lens. All images appear very sharp on my over-sharp laptop display, but I thought the G1 X images looked great and I was a happy camper. when I got home and started looking more critically into this camera's image quality (using a high-end external monitor) - including the standard DSLR test results we create, I felt that something was amiss. The G1 X images not as sharp as I thought they should be when processed in DPP with the "Viewing and saving RAW images" preference is set to "High quality" (the default). Then, the Canon EOS 5D Mark III arrived with the same problem (news post). Canon worked with me (and likely others) to quickly get a new DPP version released. The "High speed" example is posted above the "High quality" example. The difference is dramatic. 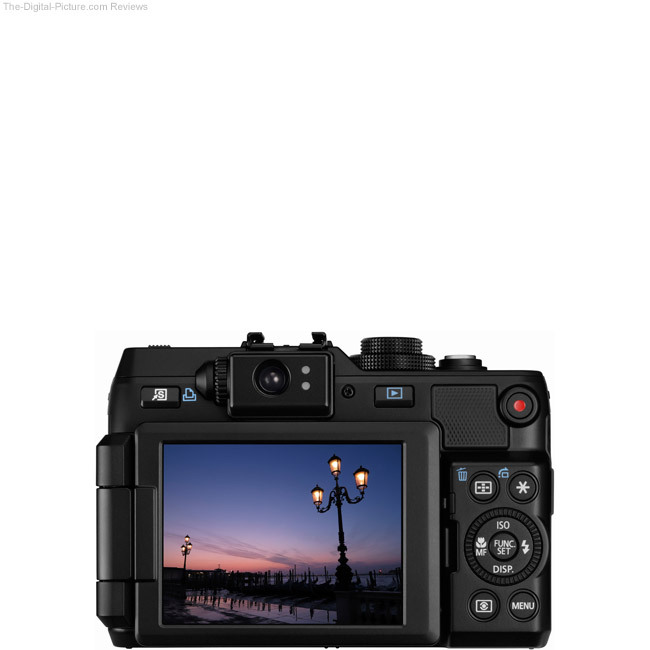 At Canon PowerShot G1 X review time, we are at version 3.11.31 of Canon Digital Photo Professional - and what I perceive to be a problem has yet to be corrected. Canon either disagrees that a problem exists - or has chosen to not make the G1 X fix a priority. The G1 X ISO 12233 results for this review show two samples being tested. In this case, both samples are from the same lens (and camera of course). Here is a G1 X comparison with itself. Sample 1 images were processed at the "High speed" setting while sample 2 images were processed at the "High quality" setting (what I normally use). I feel that the sample 1 results best represent the sharpness of this camera, but have waited until review time to process any of my G1 X RAW images in hopes that Canon would give me the sharper results along the better-cleaned-up image quality that I expect "High quality" to deliver - in a DPP update. I haven't felt the love from Canon, so ... I've finally relented to processing my images with an increased sharpness setting being my best-available "resolution" to the problem. 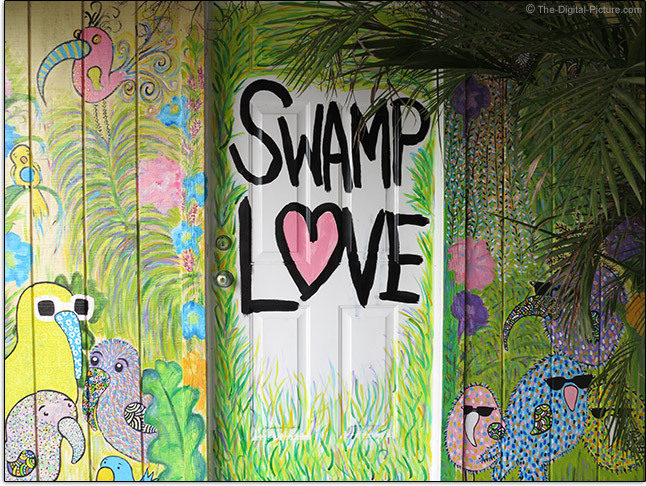 The Swamp Love picture above is of course part of my G1 X take-home from the Florida trip. The larger CMOS sensor produces a very-noticeably-higher image quality than any of the PowerShot predecessors - especially at higher ISO settings. But, testing a P&S using the DSLR testing procedures we use proved to be very difficult and time consuming without manual zoom and a manual focus ring - and with the lens auto-retracting after 1 minute. And with an LCD that does not give the same framing as the final image. Following are the pair of 100% crop image quality comparisons I have been including in the recent Canon EOS DSLR Reviews. Identical exposures, identical targets, identical lighting, identical framing and identical processing (a key point). These manually-exposed samples were shot from a Canon PowerShot G1 X mounted to a Foba Gamma Studio Camera Stand (complete overkill) and set to 24.5mm (45mm) and f/6.3. RAW images were captured with auto white balance, no noise reduction and the "Standard" Picture Style was selected in DPP. Sharpness was set to "1" (very low) and processed in Canon Digital Photo Professional (DPP) image processing software. For the examples below, RAW images were converted to 16 bit TIFF files and Photoshop CS4 "Save for Web" was used to create the 70% quality JPG crops shown below. Lighting is from a circuit-breaker-tripping 4,000 watts of Photoflex Starlite tungsten lights in a pair of daylight-balanced Photoflex SilverDome softboxes. Note that HS and HQ indicate "High speed" and "High quality" processing. Apply less sharpening and noise levels appear lower as well - the reciprocal is also true. The other important note for the comparison below is that the G1 X images needed a + .21 EV brightness increase to deliver a brightness more comparable to the other DSLRs included here. 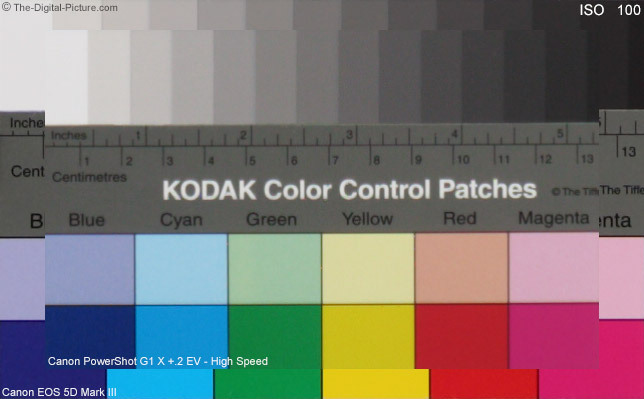 The .21 value was selected to match the EOS 5D III white color patch brightness. Even this value is slightly low for mid tone brightness levels. You won't need to worry about exposure compensation when not matching settings used with other cameras. Also note that the G1 X's 4:3 ratio requires different framing on the test chart than the 3:2 ratio cameras require. The vertical (closer to APS-C) framing was used for these tests. With those details out of the way, let's review the comparison images. There are many MB of files required to be downloaded to make all of the mouseovers and mouseclicks on this page function properly - please be patient while they load. I see about what I expected to see from the G1 X - very good noise levels up to and including ISO 1600. G1 X images are impressively clean with noise levels very similar to DSLR noise levels. Noise levels markedly increase beyond ISO 1600 and ISO 12800 is once again for marketing purposes only. Even the large black lettering is not readable at ISO 12800. G1 X ISO settings are available in 1/3 stop increments. As usual, noise reduction can be dialed into G1 X images in-camera. Along with near-DSLR-level 14-bit image quality comes near-DSLR-level file sizes. The following table shows comparative RAW file sizes for a photo of a standard in-studio setup with a moderately-high amount of detail taken with the referenced Canon EOS DSLR body. The G1 X utilizes SD, SDHC and SDXC memory cards. I've had this camera from 18 miles west of Key West, Florida to the northern tip of Maine. And what I wished most for was an at-least 4mm of extra range on the wide end. With the narrower-than-3:2 4:3 ratio this camera has, I could have especially made use of wider angles. Still, this is a nice general purpose focal length range. F/2.8-5.8 is a wide max aperture range. F/2.8 is wide/fast and f/5.8 is narrow/slow. See the Canon PowerShot G1 X lens specifications page for the full list of max aperture step down focal lengths, but you only have f/2.8 through 31mm. Canon's excellent 4-stop Hybrid Image stabilization is featured in this camera - and is especially important with the narrow apertures. With a wide open aperture, the Canon PowerShot G1 X is sharp in the center of the frame with 28mm being the weaker focal length. Wide open corners are moderately soft at 28mm, but improve nicely by 35mm (the G1 X has an f/3.5 max aperture at this point). The G1 X turns in good wide open corner performance throughout the balance of the focal length range. Stopping down improves image sharpness modestly with the most improvement seen at 28mm - which happens to be the focal length with the most available stopping down available. Vignetting is not noticeable, nor is CA (Chromatic Aberration). I suspect that both of these issues may be corrected in-camera. Some distortion correction may also be applied in-camera as slight barrel distortion shows (mostly in the corners) over the entire focal length range. The sun was round the last time I checked. The 6 blade aperture squares off the sides of the sun in this slightly out of focus f/8 image. 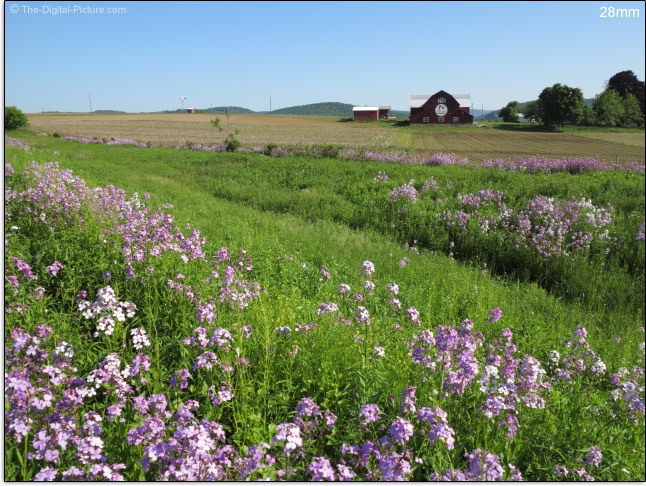 Overall, the Canon PowerShot G1 X delivers excellent image quality. I'm not ready to give up my DSLRs, but the image quality I expected from this camera is there - and is much more palatable than any previous point and shoot camera I've owned. With a relatively large depth of field, AF accuracy is not overly challenged and the G1 X gives me good autofocus results. But not at the phase-detection speed DSLR owners are used to. This is not the right tool for capturing action moving quickly toward or away from the camera. I find myself being frustrated at the overall speed of using this camera. The time to get from one shot to image review to the next shot tries my patience. The Canon PowerShot G1 X's minimum focusing distance ranges from 7.9" (200mm) at 28mm to 2.3' (700mm) at 112mm. Size is of course one of the big reasons to take the G1 X instead of a better-performing DSLR. Classifying the G1 X as a pocket camera depends on how big your pockets are. Coat pockets work fine, pants pockets will work if they are the cargo variety. I don't like carrying my gear exposed unless I'm actively using it. I mostly carry my G1 X in a Lowepro Rezo 60 case. This case can be used over the shoulder or, with the shoulder strap removed, SlipLock-attached to a Lowepro Belt or another Lowepro case. Other Lowepro cases to consider include the Adventura UZ 100, Apex 100 AW and Digital Video Case 30. While the table above shows the size difference between the cameras, the image comparisons below make this difference easier to see. The Canon PowerShot G1 X is slightly larger than the other PowerShot Digital Cameras shown here, but ... much smaller than the smallest DSLRs - the Rebel (***D & ****D) series. The spoiler here is Canon's first Mirrorless Interchangeable Lens Camera, the Canon EOS M. Sporting a full APS-C format sensor, the EOS M is scheduled to hit the street about 7 or 8 months after the G1 X. 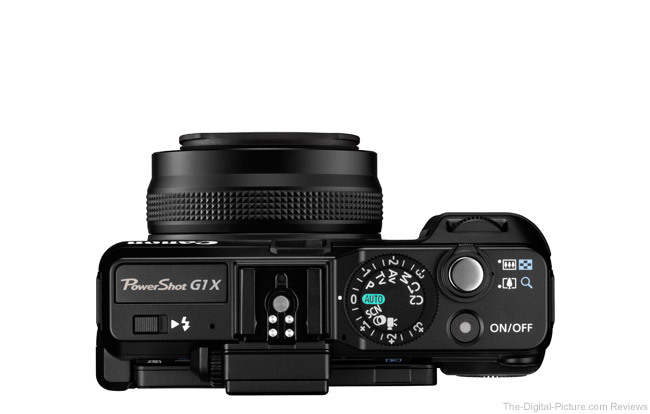 While the EOS M is smaller and should deliver even better image quality, it will be considerably more expensive with a G1 X-equivalent lens. As you will notice on the back-of-the-camera image above, the G1 X has a viewfinder. It barely meets my definition of such - and is barely useful in my opinion. Basically, I've only resorted to using it when ... OK, I'm not recalling actually using it for real photography. It is tiny, has an 80% view and the lens consumes a significant amount of the view at 28mm. On the other hand, the 3.0", 922,000-dot Vari-Angle LCD is excellent - in both image quality and in usefulness. The hinged LCD makes using the camera in any position, from directly on the ground to high overhead, easy. Self-portraits are also easy with the LCD opened and reversed. 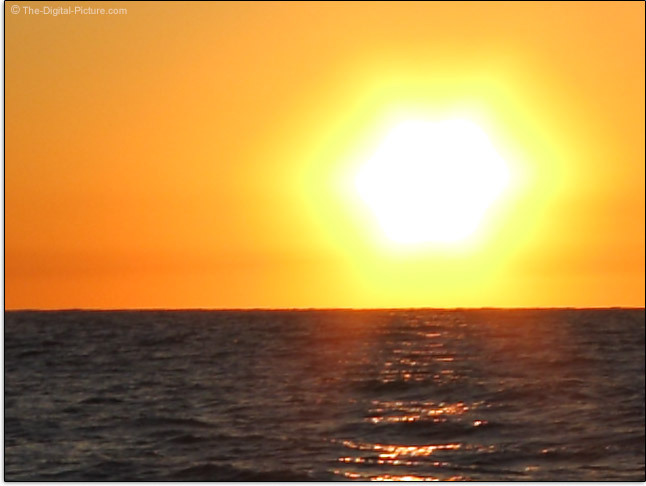 I of course appreciate the horizon level being available (note that this feature *may* need calibrated so that all of your ocean sunsets are not off-level as I learned). All of the features you have grown to expect on a high end camera's LCD are available. And the usual buttons and features are available on the G1 X's back. Inevitable with a small camera design are the small and close-set buttons. Yes, the G1 X does video - the red button on the back will start and stop your video recording. Once again, the G1 X compares favorably in size to the other DSLRs from the top. A small pop-up flash is available for fill or main lighting for close shots. A flash shoe is available for compatibility with Canon's extensive system. Two dials are available on the G1 X top - one for exposure compensation and one for the camera's shooting mode. Available shooting modes include the advanced set and include two custom programmable mode settings. The dials are easy to grasp and click solidly into their setting positions. Note also the dial on the front grip. Zooming in and out, unfortunately, is imprecisely accomplished using the switch in front of the shutter release - not the fixed (but removable for attachments) knurled ring on the lens. Manual focusing is also only available electronically. When shrinking a camera, the grip is one of the easiest features to remove. The G1 X's grip is MUCH smaller than even small DSLR grips - and I definitely miss the DSLR grip sureness when using the G1 X. Still, Canon has done a good job relative to the G1 X's size. There is enough front grip to hook fingers around and rubberized surface on both the front grip and the thumb rest increase grip sureness. I wrap one or two fingers under the camera to support my grip. Since I'm not shooting with this camera braced against my eye, I find that holding the fully opened LCD in my left hand gives me a steadier grip than with a closed LCD. I usually close the LCD with the screen inside for added protection - and so that it is ready to use in the steadier opened position. 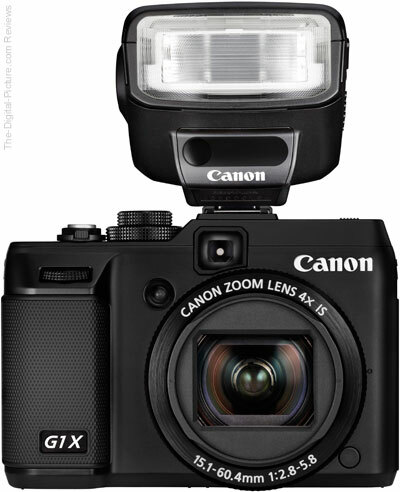 The Canon PowerShot G1 X is a solidly-built camera with a high quality feel. The design is somewhat chunky, but looks very classy. As you can see in image 3 above, the Canon PowerShot G1 X accepts filters - 58mm filters. What you need to know (and what I didn't know until receiving the camera in Florida) is that you need a Canon Filter Adapter FA-DC58C to be able to attach these 58mm filters. Filters do not rotate with AF or zooming. You of course get the battery in the box, but the Canon NB-10L Battery Pack is rated only to 250 shots when using the LCD monitor. I didn't record my actual shot capacity experience, but expect my count was similar or slightly higher than this rating. If you can tolerate the miniscule viewfinder, you can turn off the LCD and then expect approximately 700 shots from a fully charged battery. In-camera filters include HDR (3 shots taken at different shutter speeds), Color Accent and Color Swap. The Canon PowerShot G1 X's available shutter speed range is 60s-1/4000. The G1 X frame rate is up to 1.9 fps, or 4.5 fps for 6 frames in High-Speed Burst HQ mode. The processor is a DIGIC 5. Connection ports provided are USB 2.0, Mini-HDMI (Type C) and a remote switch socket. There is of course a LOT more to this camera. Check out the owner's manual linked to at the top of this review. 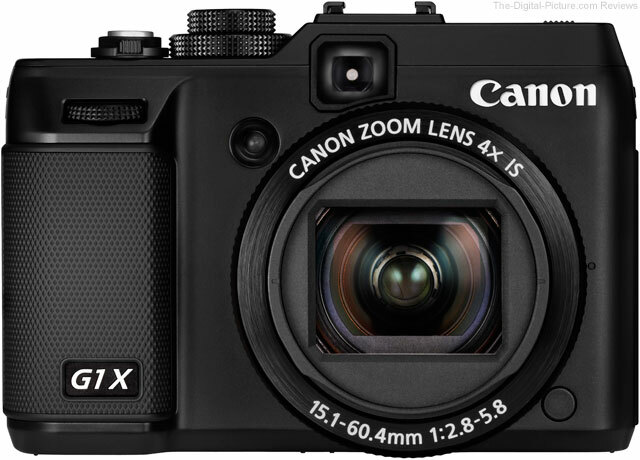 As I said earlier in the Canon PowerShot G1 X review, the Canon EOS M may be the spoiler for the G1 X, but again, the price for an equivalent M body and lens will be significantly more expensive. For some, the G1 X is the ideal main camera. Near APS-C DSLR image quality in a small form factor is a compelling reason to own this camera. For others, the G1 X makes a great backup or second camera when small size is important. I'm currently in this second category with no intentions of giving up my DSLRs. But adding the G1 X to what I'm already carrying is not burdensome and gives me an additional option for shooting - and provides a backup. 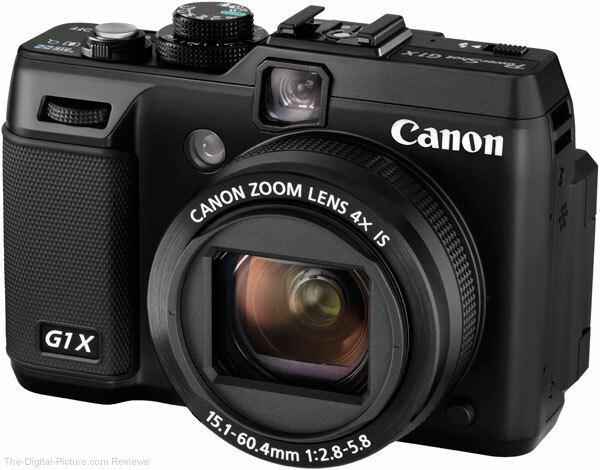 I green-lighted this camera for my mother-in-law - she is now a happy Canon PowerShot G1 X owner.